This glass and steel sculpture, entitled ‘Helping Hands’ designed in collaboration with Colin Rennie, is made up of three separate shaped panels set at angles to each other to create an overall three dimensional organic and uplifted shape. The work represents healing/helping hands, raised up in a supplicant manner as if protecting a central space where healing and calm can be found. 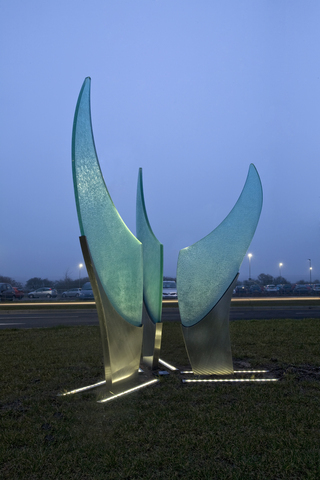 The work is made in waterjet cut, textured, laminated and toughened glass, set into a satin polished stainless steel base. The bases are welded to a thick galvanised steel base which is bolted into a reinforced concrete foundation.